During Semana Santa thousands of pilgrims journey to El Santuario de Chimayo, a tiny shrine in northern New Mexico. They leave from their homes, or their cars parked on the roadside, to walk 10, 20, 30, or even 100 miles to reach Chimayo. In the darkness before Good Friday, pilgrims line the highways north of Santa Fe carrying crosses and glow sticks. By Easter Sunday tens of thousands of worshipers pass through the doors of the little chapel, built almost 200 years ago on a site that is sacred to many Pueblo Indians and descendants of Spanish settlers. I walked 22 miles with the pilgrims through an unforgiving land where the people have known many hardships. Their stories revealed that this old tradition of personal repentance is afflicted by many modern social tragedies. As the first light of day defined the jagged edge of the Sangre de Cristo Mountains, I found myself keeping a sleepy pace with a Native American women's group. The 15 women, dressed in workout clothes and running shoes, walked slowly to honor the memory of Lori Piestewa, the first Native woman to die in foreign combat with the U.S. military. Piestewa, a Hopi from Tuba City, Arizona, died March 23, 2003 with other members of the Texas-based 507th Maintenance Company near Nasiriyah, Iraq. The Native women came from Albuquerque, representing Pueblos near and far -- Laguna, Santa Clara, and San Ildefonso. A woman representing the people of Sandia Pueblo, who sought refuge from the Spanish on Second Mesa in the Hopi lands back in the Seventeenth Century, explained, "She didn't belong there. It wasn't her place." Another woman quietly uttered, "She walks in beauty." A Navajo woman affirmed, "Her way is the beauty way." The Native American woman's role is often seen as the provider of life, and therefore sacred as the protector of continuous life, culture and beauty on Earth. The women confirmed, there is a special and meaningful connection when a Native woman's feet touch the Earth and she is not to break the connection while practicing sacred activities. As the people of San Juan Pueblo believe, "Our reverence for Mother Earth must be carried to the mothers of our children." As I set out toward Chimayo on Highway 503, I heard many tales of personal sorrow and loss, and I witnessed tremendous exertion of hope along the way. Wearing a black shawl and gray scarf, a mother walked with her daughter-in-law and prayed for her son to be rid of his alcoholism. The two women paused near the top of a steep hill to catch their breath. The daughter-in-law said her husband's alcohol addiction worsened when he lost his job nearly a year ago, not long after he had made the pilgrimage to Chimayo to pray for his family's well being. "There must be a reason," the younger woman sobbed. Dozens of pilgrims passed by looking for their own answers. Sam Escareno lifted a large cross with a figure of Jesus made from straw, covered with hundreds of purple ribbons inscribed with prayers that fluttered in the breeze. His group, from San Jose Catholic Church, brought the prayers from their congregation in Carlsbad, New Mexico. 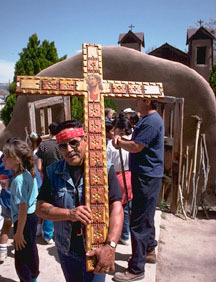 It was the group's first pilgrimage to Chimayo. I later found the cross inconspicuously propped against a fence beside the shrine, in a niche protected by a cottonwood tree. The destination of the pilgrims, El Santuario de Chimayo, is believed to hold the power to heal mind and body. A pilgrim from Las Cruces, New Mexico years ago left a note in the shrine advising: "If you are a stranger, If you are weary from the struggles in life, Whether you have a handicap, Whether you have a broken heart, Follow the long mountain road, Find a home in Chimayo..." The shrine is a time capsule for nearly two centuries of reverent pilgrims' notes and prayers, homemade crosses, votive candles and crutches left behind. Native Americans came to this place on the Rio Santa Cruz to soak their ailing bodies in the healing mineral waters long before the arrival of the Spanish. Local legend tells that in 1813, on the evening of Good Friday, Don Bernardo Abeyta had a vision that led him to discover the Crucifix de Nuestro Señor de Esquipulas, the "Black Christ of Guatemala," buried in the bank of the river. Through a series of mysterious events, villagers believed El Señor de Esquipulas could not be removed from the site and that Don Bernardo Abeyta was spared from death by the deity. By 1816 local families built a wood framed adobe chapel over the sacred site. Faithful pilgrims have come to the chapel ever since seeking remedies and cures from "Our Lord of Esquipulas" and the healing powers of El Posito, the sacred earth from beneath El Santuario, where the Crucifix was discovered. Though the back roads to the shrine were not paved until the 1970s, modern pilgrims follow much the same routes that have been traversed over the barren land for nearly 200 years. On U.S. Highway 84/285, pilgrims now pass by Indian casinos and crosses on the side of the busy six-lane highway where numerous fatal accidents have occurred. The walkers still come from towns along the historic Camino Real -- Santa Fe, Socorro, Las Cruces, El Paso, and from towns farther along the old route reaching deep into Mexico. Bruce Abeita walked 107 miles over four days from Isleta Pueblo south of Albuquerque, braving fierce New Mexico desert winds as he camped on his way. On the third day of her journey, I met a woman with a big smile and round face who had walked more than 20 miles from Agua Fria, a traditional agricultural community southwest of Santa Fe. Rural farms, such as those around Agua Fria still operating today in the San Luis Valley, supported wayward travelers on the historic supply route from Mexico. With almost 10 miles to go, the woman assured me, "You can bet I'll reach that Santuario." Brushing gray hair from her sunglasses and looking toward the sun rising in the east over the mountains, the woman invited me to Easter services near her home at San Isidro Catholic Church. In her purse she carried a figure of San Isidro, the patron saint of the farmers. In a feisty parting moment, she gave me her reason for walking more than twice her usual distance to Chimayo. She intentionally journeyed by the casinos on the busy highway between Santa Fe and Española. She wanted the casinos to see her pass by on foot because she wanted them to know she "believes in God, not in money." Her sign read, "Bet on a sure thing." With a cedar tree branch for a walking stick, the woman left me behind while I crossed the busy highway for water being given away at a Red Cross station. Relief stations along the way were staffed by Pueblo police officers, sheriffs, state troopers, Red Cross volunteers, and just good Samaritans who generously offered bananas, oranges, granola bars and bottled water. Pueblo languages -- Keres, Tewa and Tiwa -- are heard each year on the journey, along with English and Spanish. A woman from Mexico recited prayers in Spanish over and over as she covered the miles for a young girl back home who suffered with cancer. Like many others, she carried an image of the Virgen de Guadalupe. A family from Denver joined the pilgrims to support a relative in the military. A few walkers carried American flags or wore yellow ribbons. Some clutched rosaries. Many prayed for peace and almost everyone I spoke with believed the excessive crowds were due to the war. From the usual 10,000 to 30,000 pilgrims, along with locals and tourists who enjoy the spectacle, the numbers were thought to be up to about 40,000 by police estimates. By 10:00am the walkers formed a steady stream moving toward Chimayo and the narrow two-lane highway, NM 503 came to a stand still. Bike riders and low riders, and families in pickup trucks inched along slower than the shoe-bound pilgrims for the last six or seven miles over the high desert mountain road to reach El Santuario. Grandmothers led their granddaughters by the hand to show them their veneration for this land and their faith. Highway 503 cuts across a stretch of dramatic deeply eroded barrancas and shrub brush-covered land the Spanish called El Malpais (The Badlands). The arid desert between the Rio Grande (the lifeline of the Spanish along the Camino Real) and the Sangre de Cristo Mountains (the sacred life source that provides water across the land for the Pueblos' survival) supports a climate best suited to rattle snakes on hot summer days and coyotes on chilly nights. Springs and snow melt feed the arroyos and irrigation channels that become tributaries to the Rio Grande, making the land barely inhabitable for those who stay cool inside thick adobe walls during the day and burn piñon for warmth at night. But "La Tierra" is more than just inhabitable to local Indians and Hispanics -- it is their "herencia," their sacred inheritance. Many still profess to live in harmony with nature and produce art that is as religious as the symbols they carry with them to El Santuario. Blue skies evoke the color of turquoise; Sparkling mountain streams reflect silver designs; And, the rays of the fading sun turn the rugged hills into a soft landscape painted with the colors of many people. Flowers spring forth designs for pottery and weavings. At the Pueblo Cultural Center, the words of Theodore Jojola, from Isleta Pueblo, justify the wisdom of the creators of all natural things in the Pueblo world: "So they created the mountains, mesas and valleys to make us humble and make us repentant." As the sun climbed high in the sky, weary pilgrims quickened their pace as they followed a shortcut across a field to face the last couple of miles. The road turns north and narrows, as it descends into the Chimayo Valley. Piñon and cottonwood trees hide the few rooftops that would be visible from the steep roadside embankment. A man told his children, "(The road) is dangerous here. Walk single file." Walking down hill into town, I found hundreds of people evacuating the narrow main street after visiting El Santuario in the early morning. Completing his pilgrimage, Bernardo Lujan Jr., a distinguished gentle man with waves of long silver and black hair gathered his family around a large wooden cross he made and carried on his way. The tattered note left by the pilgrim from Las Cruces, in a year long since passed, romantically and accurately described Chimayo: "It's a small Spanish town settled many years ago by people with a friendly hand. Their culture still lives today. They will tell stories about miracles in the land since 1813. Santuario is a key to all good. A church built as graceful as a flower, swaying in the summer breeze, nested in a valley protected by wild berry trees. In the dusty roads of Chimayo little children with brown faces smile. Majestic mountain tops rule over the virgin land." As I neared the shrine, hidden behind its wooden gates and adobe walled enclosure, I spotted two bell towers covered with modern tin pitched roofs, rising above evergreen trees against a blue sky. El Santuario was designated a National Historic Landmark in 1970, though it has changed a little with the changing times. I discovered a line over a quarter of a mile long, wrapped around the churchyard and through the narrow town street, with anxious pilgrims waiting to get inside the little adobe building. Some with walkers and others with wheel chairs were helped down the steps into the sunken chapel by others in line. Several pilgrims were overcome by exhaustion, but not before they reached their destination and made their peace. With only 26 pews on what was once an earthen floor, now covered with stone, fewer than 100 people can sit and meditate before the altar, and fewer still can get into the little side room to make contact with, or even taste the sacred earth from El Posito. The dirt that is said to heal is replenished and blessed periodically from the bank of the Rio Santa Cruz. Thousands remained outside the chapel, creating a carnival-like atmosphere. In addition to salvation, pilgrims find vendors in their little tiendas selling Chimayo Holy Chile, and offering a little witty conversation. A soft drink seller laughed at a local woman, a regular parishioner at El Santuario, "You drove TEN miles to park and walk back to your own church!" Beside the chapel's tiny parking lot, which local police close off for much of Holy Week, Leona's serves hot chocolate on cold mornings and corn and green chile tamales on hot afternoons. Stocks run low soon after the large crowds arrive on Good Friday. Children busily arranged stones in the churchyard and fished coins out of the acequia, the shallow stream that runs in front of the shrine. Dogs pulled at their leashes at the sight of other dogs and howled at the ringing bells of roving ice cream vendors. One little boy, bored by the whole occasion, held his pouty face between his fists, and never looked up as visitors one after the other captured their own classic post card moments on film. A continuous mass was held behind the church, down by the small swift river driven by the snowmelt from nearby mountains. Adults listened intently while children and dogs played at the base of the outdoor altar. Simple crosses made of bark, dried leaves and popsicle sticks are left year round on the fence surrounding the church property. I lost track of time before realizing that the sun had traveled across the sky and was setting over the Jemez Mountains to the west. On the way back I detoured to hilltops covered with crosses, Santos and offerings. At one shrine I met Lena Beyal, a woman from Los Lunas, NM whose son Santiago had recently arrived in Baghdad, Iraq with the Fourth Infantry Division of the U.S. Army. Standing before a towering white metal cross draped with purple cloth, she asked me to take a photo of her holding a picture of her son. She carried it with her on her pilgrimage and prayed for his safe return. After 22 miles, four or five pieces of fruit and a gallon of water, I felt the healing effects of the vast land and its demanding journey, but I didn't find as much peace of mind knowing that so many people in the world need healing. The amassed numbers of pilgrims tell a tale of growing desperation in the world. The pilgrim from Las Cruces wrote a perfect closing to the story in his note, at least of the "old world" story that Chimayo was once a part of: "When the day is done the sun falls asleep without regret, sleeping in the twinkle of a starry, starry night. It's that old country feeling in Chimayo I can't forget. Of all the places in the world I've been, this must be Heaven." In a strangely coincidental occurrence, while purchasing homemade bizcochitos in a local Chimayo tienda, I flipped through a published speech by Chellis Glendinning and noticed that she quoted a local man who observed, "The down-to-earth people are finishing." Only a few years ago on my second or third visit, I felt the participation in the pilgrimage was decreasing. For various reasons, well beyond the residents of Chimayo and the pilgrims who come here each year, it appears the tradition is strong again. I partly felt secure in knowing that this tradition is still in tact for many "down-to-earth people," but for paved roads, a Wal-Mart just down the street, cell phone towers over head and news of a Native woman killed in Iraq, the world is closing in on the tiny village. "The down-to-earth people are finishing?" I was left wondering: Are their values vanishing in my lifetime? Does their culture matter? Is progress their best bet for the future? The Lensic Theatre re-released the film "Milagro Beanfield War," based on the novel by John Nichols. "Milagro Beanfield War" tells the story of a vanishing way of life, of the willful displacement of one culture by a more aggressive society. The film is a fictionalized version of a real story in which the costs of a project, a money-making endeavor, were to be shared by the community and the profits were to be realized by the privileged few in the best position to profit. In a paper for the University of Colorado Department of Ethnic Studies, Kenneth Orona wrote of the actual situation: "Initially, farmers -- the majority of whom where Mexican American -- supported the construction of the Indian Camp Dam, but after learning the financial details of the plan they refused to support it. Their complaints focused on the proposed Rancho del Rio Conservancy District, empowered by the state of New Mexico to impose taxes on residents living within the district's boundaries. Farmers soon learned the proposed conservancy district required them to pay for a portion of the construction costs and one-half of the maintenance expenses for the dam. Farmers believed that they did not possess enough property to commercially benefit from the project and that their inability to pay conservancy taxes would result in the foreclosure of their farms and loss of their property. Finally, opponents viewed the District Court's appointment of conservancy officials making up the board of directors as undemocratic and an affront to their existing system of water management which relied on locally elected officials. Over the next five years Chicano activists and Anglo-American environmentalists joined the Spanish-speaking farmers in forming a grassroots organization called the Tres Rios Association which successfully fought the creation of the conservancy district in court." For many who lived in the small traditional rural communities, there was little chance of joining the few who would profit, for they hadn't yet learned greedy practices. They had merely subsisted on what they recognized as their needs -- crops, shelter and a peaceful coexistence with the land. Lacking the ability to keep up with the increased costs of infrastructure, and certainly the added dimension of tourism development and enterprise, meant foreclosure on their only real possession, their property, was a real possibility. As I looked around at the beautifully restored Lensic Theatre in downtown Santa Fe, I recognized the very people who are changing the traditional values of New Mexico and making it more like the places they came from. Though perhaps inadvertently, the mostly Anglo newcomers are making it very difficult for the people who have lived in New Mexico generation after generation, going back to settlement under Spain and Mexico long before the Treaty of Guadalupe-Hidalgo, to maintain life and family and faith as they have known it. Many of the economically mobile newcomers enjoy the strong cultural traditions, but they don't necessarily see independence as a virtue. They are highly motivated by profit; they see people as human resources, Pueblos as places with little collateral, growing towns like Española as workforces, students in the suburbs of Los Alamos as latch key kids who need digital entertainment, and unique cultures as opportunities for tourism. To them, it stands to reason that people with sun need lakes and resort hotels. The deep undercurrents in the battle for New Mexico are as fundamental as possession of culture. But the people with their strong values and traditions that have been passed from generation to generation are just outside the museums, going about their business, living their lives. It would be wrong to think, because I've studied the many great cultural resources the state offers, that I know more about the "down-to-earth people" of New Mexico than they themselves know. Out in the community, in the Pueblos and historic villas, there is usually a simple explanation to take the place of walls covered with charts and archaeological evidence. If nothing else, I do know the heavy outside world that is closing in on old New Mexico very well, because I'm part of it, even if not by choice. The "down-to-earth people" of New Mexico may not have much choice in their future. The questions most on my mind lately: How are things now? And, what's in store for these independent-minded people? I talked with many local people on the pilgrimage and in the towns and cities of northern New Mexico. I asked them, how do the Santos and Pueblo potters, makers of sacred objects for their respective cultures, carry on their traditions? I asked Asian Americans, as independent business owners of historic and distinctive Route 66 motels on Cerrillos Road, how they are able to compete with the corporate establishments that have surrounded them? There were only vague answers. Each new period in New Mexico's ever-changing cultural landscape brings a new people on a new path: the Zuni Trail, El Camino Real, the Santa Fe Trail, Route 66, the Interstate highway system.... But the current path is much more treacherous and destructive. Many people have been thinking tirelessly about these issues -- Chellis Glendinning for one. In her reprinted speech "A Map (From the Old Connecticut Path to the Rio Grande Valley and All the Meaning Inbetween)", she laments the disappearing independence of the Pueblo peoples as a symptom of globalization. The Pueblo peoples, however, point to something that is immobile, at least as they know it -- the tall mountains and water that cascades from their snowcapped peaks. On Easter Sunday I hiked five miles in deep snow up to Lobo Peak, reaching over 12,000 feet, north of Taos Pueblo. as I descended in the late afternoon, I found many Taos men, with their children playing along side them, fishing for trout in the Rio Hondo. They were glad for the snow melt and equally grateful for the peace and quiet that comes when the ski resort closes and the tourists go home. With thier children nearby, content to rake their fingers and toes through the earth, making designs in the river sand, the men have hours of tranquility until it's time to report on the status of dinner. Then they have their cell phones (and a Wal-Mart nearby, open 24 hours on the holiday, with an eager service staff and a parking lot full of cars, in case they need to bring home potato chips and colas for dinner). Through nationalizing of culture and the global implications, we will explore and discuss the role of diverse cultures in politics, economy, environment and media, with a discussion about racism, public attitudes and stereotypes. For more information: email info@houstonculture.org, or phone 713-521-3686.